The Postal Service today announced more subjects that will be featured on Forever stamps in the new year. One of those people honored will be civil rights icon Dorothy Height. 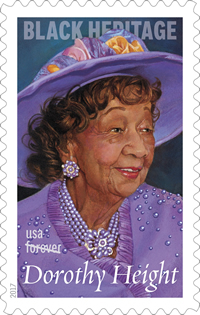 The 40th stamp in the Black Heritage series honors Dorothy Height (1912-2010), the tireless activist who dedicated her life to fighting for racial and gender equality. Although she rarely gained the recognition granted her male contemporaries, she became one of the most influential civil rights leaders of the 20th century. The stamp features artist Thomas Blackshear II’s gouache and acrylics on board portrait of Height. The painting is based on a 2009 photograph shot by Lateef Mangum. Art director Derry Noyes designed the stamp.